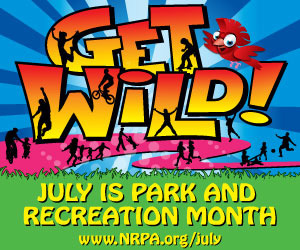 July is National Park and Recreation Month and we have a lot of fun planned at Wylie Recreation Center. ●Rec Pass required unless otherwise indicated, and there is no additional charge unless otherwise indicated. ●Sign in at the front desk 15 minutes prior to each event unless otherwise indicated. ●Children 18 Mos – 6 Yrs. must be with parent or guardian. More bouncing and fun interactive games! Race up 26 foot tall coconut trees! The first one to the top is the winner and their time is displayed for all to see. M, 7/2, 1 - 3 PM, No Rec Pass Required! Show off your hula skills! Recognition for the longest time, wildest and most hoops. Race to the top of this crazy inflatable. 4 players climb the “bubble” to claim victory! Hit the bike trails for this virtual race! Registration for Trixter Races begins 7/2, 9 AM at the Front Desk. Children ages 12 – 15 years must be with an adult age 18 years or older to participate in race. Climb the walls in this fun competition against Recreation Center “regulars.” Open Climb Schedule available at Wylie Recreation Center and online, www.WylieTexas.gov/Recreation. Competition ends 7/13, 2 PM. Seriously silly, Olympic inspired games! Game time with a 36” ball! Water slides and fun on the front lawn! Wear swimsuit and sunscreen. Bring a towel. W, 7/18, 10 AM - 2 PM, No Rec Pass Required! Feel the outdoor love for Wylie parks! Make friends with the flora! Plant your own take-home zinnia and learn from Park professionals about these lovely flowers. F, 7/20, 10 AM - 2 PM, No Rec Pass Required! Pick your faves and make your own summer mix. Raisins, craisins, seeds and more! Post beloved Wylie Parks to your IG page for prizes! Rules and list available in Courtyard or Front Desk on first day of hunt. F – Th, 7/20 - 7/26, 10 AM, No Rec Pass Required! Monopoly, checkers, Kinect and more! Bring the family. Yo party party! It’s Dancey Dance time! Singing, dancing, games and a visit from a very special Gabba friend. F, 7/27, 1 - 2 PM, No Rec Pass Required! Guys and dames, put on your glad rags for this one-of-a-kind dance party. It’s the cat’s pajamas! Singles welcome. Refreshments provided. Includes 45 minute Charleston demo. Dance starts at 8 PM. Costumes not required, but applauded! Sa, 7/28, 7 - 10 PM, No Rec Pass Required!